A mysterious drifter named Paul (Ethan Hawke) and his dog Abbie make their way toward Mexico through the barren desert of the Old West. In an attempt to shorten their journey they cut through the center of a large valley, landing themselves in the forgotten town of Denton — a place now dubbed by locals as a “valley of violence.” The once-popular mining town is nearly abandoned, and controlled by a brash group of misfits and nitwits. Chief among them: the seemingly untouchable Gilly (James Ransone), who is the troublemaking son of the town’s unforgiving marshal (John Travolta). The movie opens Friday in theatrical and VOD release. 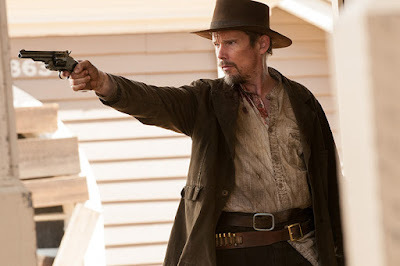 Here is an interview I did with lead player Ethan Hawke, and here is another Q&A I conducted with director Ti West -- both for Cowboys & Indians Magazine. Middle School: Fun for all ages. No kidding.